We care passionately about our brands and about how customers perceive them – and we want people who can share that passion with us. That means thinking not just about the products themselves, but also about the impact they have on customers and how they can help people live more positive lives. We encourage our marketing professionals to build up broad experience of our brands and products, progressing through multiple disciplines and working on both business-to-business and business-to-customer channels. One popular route for graduates is to join us straight from university as a Category Executive before taking on responsibility for a line of over-the-counter products as one of our Category Traders. 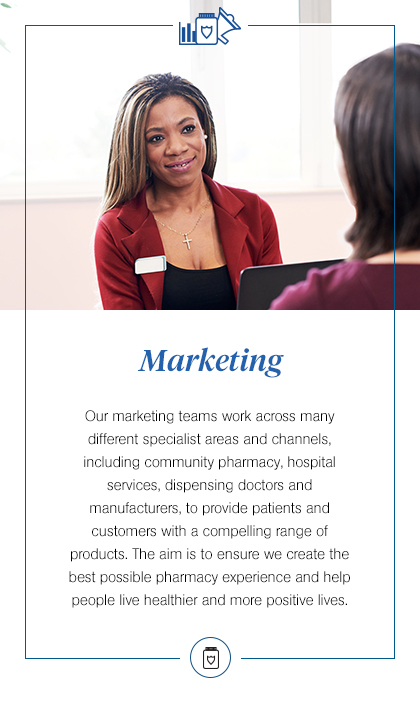 Explore our Marketing teams to see where you fit in. Gathers continuous insight on customers, competitors and the market through trend analysis, portfolio planning, segmentation profiling, data analytics and more. Responsible for everything from trade marketing plans and tactical sales marketing to omnichannel planning and brand guardianship. Chiefly responsible for marketing, promotional and implementation plans, and for content management across brands and sales channels. Typical roles here include Content Executive, Social Media Executive and PR Executive. A diverse area of the department that includes promotions, visual merchandising, space planning and category development.